If a total knee replacement becomes infected, loosens or is persistently painful, then a revision knee replacement may need to be performed. 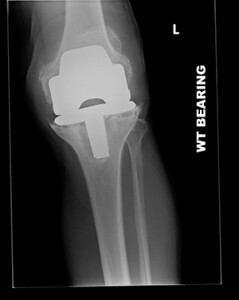 The operation involves removing parts of, or all, original implants and inserting new components. The diagnosis of an infected knee replacement is made on the history and examination with findings of a painful joint which can be red, hot and swollen. An aspirate of fluid from the joint maybe taken to assess for bacteria in the fluid and blood tests will be taken. Joint replacements can loosen with time without infection, and the diagnosis in this instance is made when a joint becomes painful, XRays show loosening, and infection has been excluded on blood tests and aspirates. A revision may be performed as a 1-stage procedure in which all the implants are removed, and a new implant inserted in the same operation. If the cause of failure is infection, a 2-stage procedure maybe required in which the implants are removed, and the infected bone cleaned (debrided). Antibiotics are given for around 6 weeks, and once it is established that the infection has been eradicated, then new implants are inserted as a 2nd stage procedure. In the intervening period crutches are required so as to not put full weight through the knee with no joint surfaces. The void created by removing the implants is usually filled with antibiotic loaded cement ‘spacers’, moulded to the shape of the knee to allow some movement and reduce stiffness. The risks for revision TKR generally fall into the same categories as for a primary TKR. However, the risks are slightly increased , in particular - infection , stiffness and ongoing discomfort, have increased risks as the procedure takes longer , and is more complex than a primary procedure. The results for revision knee replacements tend to less good than for initial replacements. Patients are improved by the revision surgery, but satisfaction and range of motion tend to be less than after the original surgery. Length of surgery? 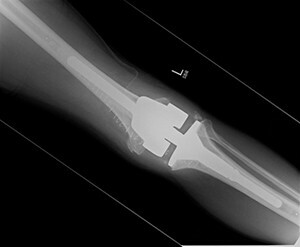 The operation will take between 2-3 hours depending on severity of bone loss around the existing knee replacement. What type of anaesthetic? 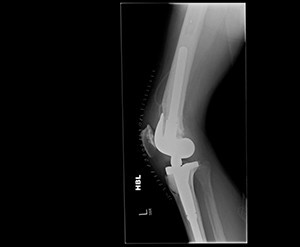 Revision TKR is usually performed under a general anaesthetic, rather than under a spinal anaesthetic, due to the length of time required to perform the procedure. Length of stay? Patients will stay 3-4 nights in hospital, depending on speed of recovery. When can I drive? Returning to driving requires strength to return to the leg, and will usually take 6 weeks. Physiotherapy usually commences on the day after surgery, and by the time of discharge, patients should be walking with crutches, able to climb stairs, get in and out of a car and manage bathing. Rehabilitation is vital after revision TKR, to restore muscle strength, ensure full extension is maintained, and regain as much flexion as possible. Using the cryocuff regularly helps reduce swelling and pain, which are the biggest obstacles to regaining good flexion. Clips are removed at 10 days post-operatively depending on healing. The scar is over the front of the knee – approx. 7-8 inches long (18-20 cm), and will follow the course of the original scar. It is very useful to massage the scar with creams or oils once it is healed. Will I be followed up? Follow up appointments are normally at around 6 weeks, 6 months, and 12 months post-operatively, but will be dictated by the reason for the revision procedure particularly if infection is the cause for surgery.